December 23, 2016 November 8, 2017 - by HAHAPPY - 12 Comments. 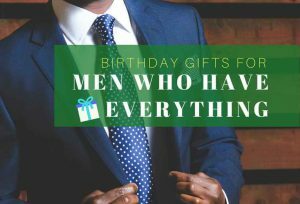 Your baby boy’s 1st birthday is coming soon. 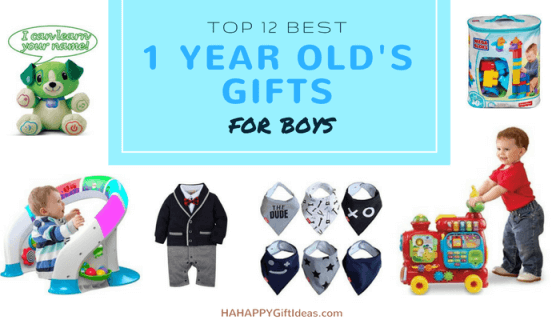 Just like most of the parents, you might want to spoil him like a little prince by the Best Gifts For 1-Year-Old Boys on this special day. Indeed your baby boy is an active little people now, and he has started the amazing journey to explore the world. 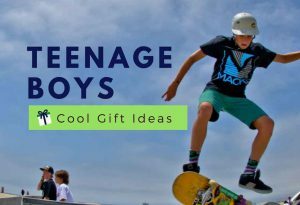 To get you covered, we have found out 12 unique gifts for one-year old boys that both the little gentlemen and parents will LOVE – from educational toys to clothes and mealtime set. 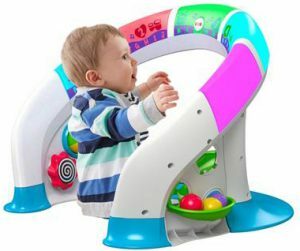 Fisher-Price Bright Beats Smart Touch Play Space is the perfect gift for the 1-year old’s active little people! This innovative gift is featuring in its interactive, touch-sensitive light bar that with three ways for baby to play. It encourages the little child to get up and move! The little boy will get the fun in the busy activities, music, lights, colors, and sung songs. 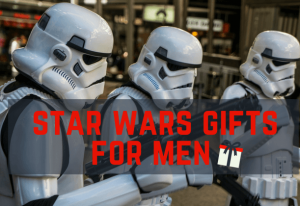 It’s the ultimate toy and gift for baby boy’s growth & development! Response to sound by making sound is one of the important developmental milestones of the one-year-old child. 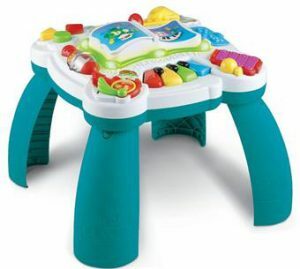 This Learn and Groove Musical Table Activity Center from LeapFrog turns up the sounds of learning fun. It provides endless fun to the children through exploring sounds, songs, and instruments such as the piano, drum, xylophone, trombone, and guitar. The little guy will absolutely LOVE this fun and awesome learning table! 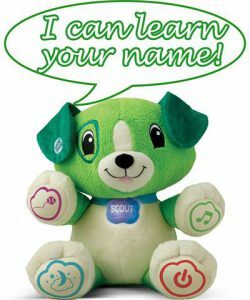 This electronic toy My Pal Scout is the best gift to personalize 1-year-old boy’s learning. Just download the little one’s name to this cuddly customizable puppy, and he’ll spell it out. In addition, this puppy toy teaches first words, emotions, feelings, and counting. Moreover, it has a lullaby timer of bedtime music, a blinking collar, and volume control to help little on boys transition to quiet time. It is not just a gift to the little boys, but this puppy will 1-Year-Old be his best friend as well! Hape Shape Sorter Turtle is one of the unique birthday gifts for the 1-year-old boy who start developing logical thinking skill and hand-eye coordination. This wooden turtle toy comes with 5 piece wooden shape blocks that help the little kids to learn how to sort shapes and distinguish colors. The pulling feature contributes to building confidence for the early walker by providing a playmate. This wooden turtle is made from non-toxic materials, child-safe and of the highest quality. This great little gift can truly stimulate the little guy’s mind! Blocks are essential toys for early childhood development as it helps to develop the kid’s motor skills and hand-eye coordination, and also build up the creative mind of the little one. 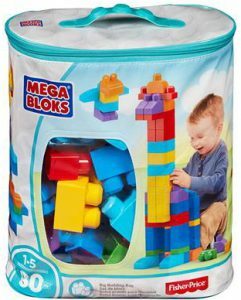 The Mega Bloks Big Building Bag included 80 pieces of First Builders blocks for hours of play. It is designed especially for toddlers as all the blocks are easy to hold, stack and take apart. All the blocks come in a variety of color schemes, including classic colors, lighter pastels, and trendy bright colors. The set also includes attachable wheelbase to build cars and trucks that boys will love it. The entire set is packed with a Portable, PVC-free bag zips to store all blocks.This amazing bags of blocks is a wonderful gift to give endless possibilities and fun to the little guys. This Vtech Sit-to-Stand Ultimate Alphabet Train is designed to grow with the 1-year-old child. This toy train can be a gift as a toddler floor toy, baby walker or a pull toy wagon they can fill with toys. The entire toy comes with 10 activities, which including storybook, gears, and clock. It has 13 double-sided alphabet blocks that can develop fine motor skills and teaches letters, numbers, colors and more. Also, it features more than 100 songs, melodies, sounds, and phrases provide endless fun for the little one. 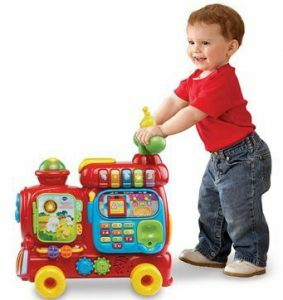 This educational toy train is an excellent gift for the little guys who are starting to learn and walk. 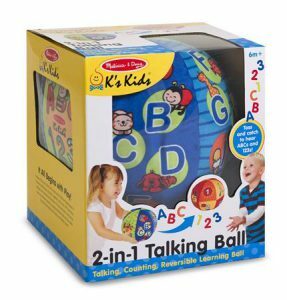 This amazing talking ball from Melissa & Doug is a fabulous gift that little guys will LOVE! The ball is very special with its impressed designs. The fabric is reversible with a design featuring the ABCs to one with numbers. There is a speaker to recite the alphabet and say numbers, and it is motion activated and only generate sounds when it is tapped, bounced, or dropped. 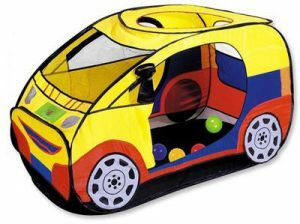 This educational ball can promote learning in the right order and it is an incredibly fun gift for the little boys. Your little athlete will surely love his own Sports Bag. 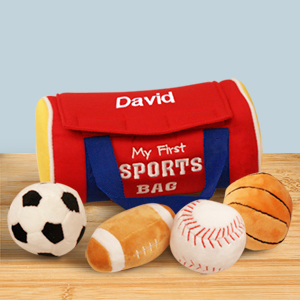 This Personalized My First Sports Bag bag makes for a perfect personalized birthday gift for any boys at age 1. The soft plush tote may be customed with any name and is filled with four toy balls. It measures 7″ x 4″ x 3″. Your little one is ready to grow with this adorably personalized growth chart! 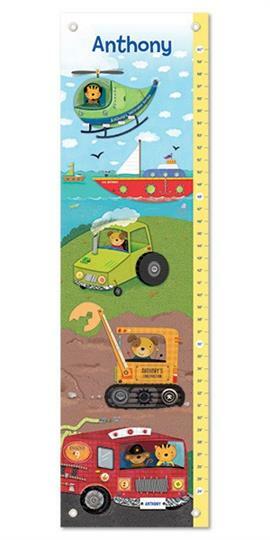 This funny illustrated growth chart comes personalized with your child’s first name and is produced with artist grade canvas. 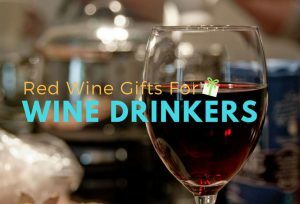 Best of all, it comes packaged in a pretty gift box makes it perfect for gift giving. Each growth chart measures up to 60″. 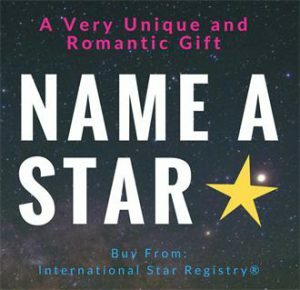 A unique personalized gift always warm the little one’s heart while the parents as well. This Who loves Me? books and Lovie blanket set is absolutely one of the surprising gifts for 1-year-old boy who has everything. The name of the little one will be printed in the book Who Loves Me?. What’s more, when ordering, you have the option to upload a photo of the little guy to appear on the dedication page of the book. Kids love seeing their names and photos in print! 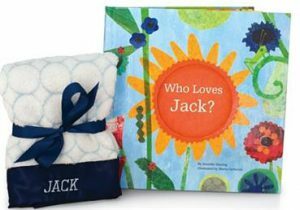 The blue Lovie blanket comes with the boy’s name embroidered on the satin trim. Baby picture frames make a great keepsake for a 1-year-old boy, especially when it personalized with his name. His cute photo is going to look fabulous centered inside this adorable, colorful Train Picture Frame Keepsake. Add the touch of personality to your little prince’s cool new trainers, with this Mr. Men high tops. 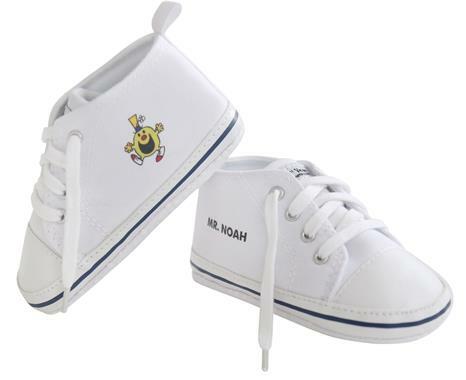 These white high top baseball pre-walkers are totally unique to your little one, with a choice of Mr. Men character and name to be printed on the shoes in the iconic Mr. Men Little Miss font. 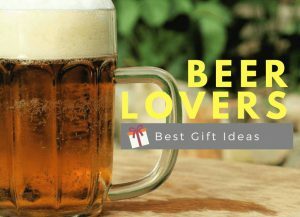 Not sure what to give for the one-year-old boy on your gift list? Then you can’t go wrong with this funny Long-Sleeve Top & Pants Set. This set features monster design and jagged trim, it will definitely add fun to the little one’s playtime. 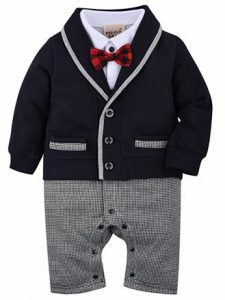 The cuteness and smart boys deserve the best Tuxedo Jumpsuit gift. With the soft cotton, This ZOEREA Baby Boys Romper Suit will not become a burden for the baby. It also with button closure, and comfortable for wearing and convenient for diaper changing. 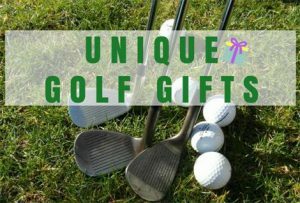 It is ideal for many special occasions: birthday party, Wedding, family celebrations, Easter, etc. Also appropriate for baptism or christening and daily wear. The attractive bow tie cannot be removed, thus, very safe for the one-year-old boys. 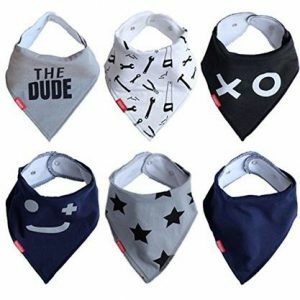 Both the little guys and parent will love this cutest, trendiest drool bibs! This bibs set includes 6 high-quality and stylish bibs in hand-made feel. All bibs feature in cool colors, fun mix designs, and match to complement any little outfit. These are made from 100% high-quality soft cotton with an absorbent fleece backing. They are quick and easy drying, light in weight, machine washable, and comfortable for all-day wear. It has two adjustable metal snaps to keep the baby’s bibs hold right on the little guys. These cool bibs set makes a perfect 1-year-old gift …because the active little boys can never have enough bibs! Self-feeding is one of the important things on the to-do list of the one-year-old boys, but it always becomes a messy job at the end. The Avanchy Baby & Toddler Bamboo Plate Set is a beautiful and excellent gift that makes meal time a little less messy. This mealtime gift set includes 1 bowl, 1 suction divided plate, and 5 spoon pack (green, blue, orange, yellow & magenta). 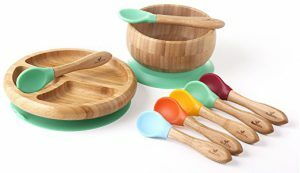 This amazing set is made of high-quality biodegradable bamboo and BPA-free food grade silicone. The spoon is soft for the small mouths and long enough that makes it easy for mom to reach. This gift set will definitely give a pleasure mealtime for both the little guy and his parent. 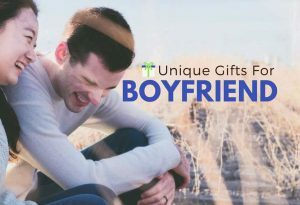 What thoughtful gift ideals! I love them all. Especially the bamboo self feeding set. Very nice and useful. Green and way better then metal or plastic. Although I would like to see more wooden simple toys then the plastic as I follow the European model more then the American and we use simple wood for safety. Great site though! What an adorable. Love the ideas of your site. After this article, I just saw number 10, 14, 16, and 17 are cutest! This look like baby shower gifts, when the babies are needed. The toys are very nice! I actually fall in love with babies as my dream. That’s why I came here to look. Overall, your content is great! 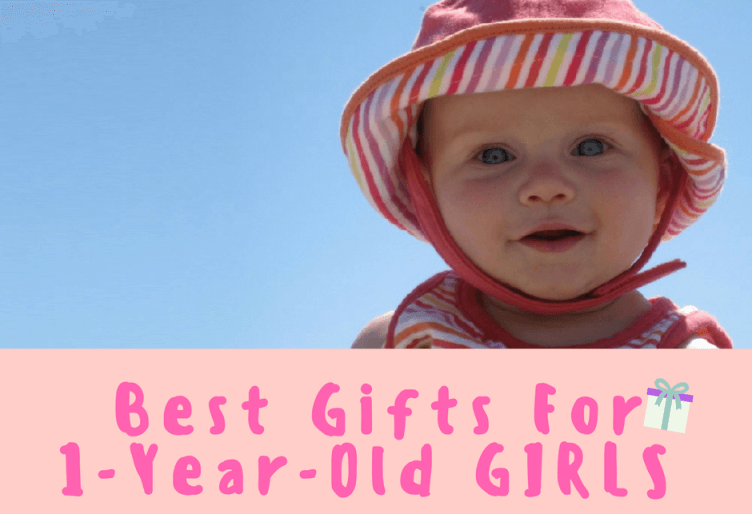 This is the best list ever, I wanted to get something for my friend s son who is about a year old now. 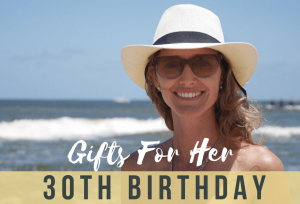 Since I have no kids, it is really difficult to look for a gift and try and understand what a one-year-old might really want. 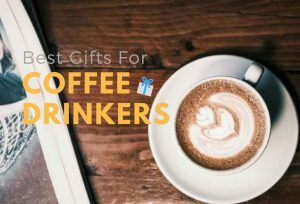 These gift ideas are great and I might get one among them, thanks for the amazing list. Finally, a guide to go by. I find it extremely difficult to buy gifts for toddlers, let alone boy toddlers. I like how most of these are generic but I think I’d personally lean toward the toys that encourage creativity like #6. Thank you for this post and making it easy to find most of these on Amazon. Welcome to our site and thank you for your feedback. 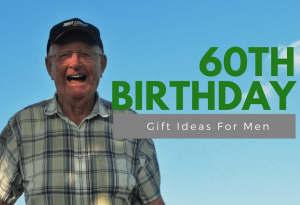 Brilliant ideas here in this post.I will send it to some of my friends, it is always good to have some selected ideas to choose from. 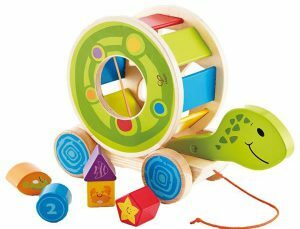 Just one question about Hape Shape Sorter Turtle, I guess it´s sure that it is not too heavy for little hand to move it around?